Many natural cationic peptides in mammals (e.g. human LL-37) only have antimicrobial activity in dilute medium and do not have strong bactericidal activity at the cation and peptide concentrations found at many body sites and fluids. However under these same conditions they have a range of immunomodulatory activities. Functional genomic, animal model and biochemical studies from my laboratory have demonstrated that these peptides interact directly with host cells to modulate innate immunity in a unique fashion, decreasing potentially harmful inflammation while stimulating protective innate immunity. These effects are being pursued in an attempt to understand the roles of antimicrobial peptides in innate immunity. They also led directly to the founding of a company Inimex Pharmaceuticals Inc. that developed an entirely novel approach to counter infectious diseases and took this to the clinic. Thus my lab has identified small, so-called Innate Defence Regulator peptides that boost the infection-fighting mechanisms of innate immunity and/or suppress harmful septic and inflammatory responses and determined and published the mechanisms involved in Nature Biotechnology. This in turn led to the award of two consecutive Genome Canada grants to study the Pathogenomics of Innate Immunity (with me as co-Director) and to two Grand Challenges in Global Health grants to develop novel anti-infective therapies based on the modulation of innate immunity, and new adjuvants for single dose vaccines. (eg. Nature Biotech 25:465-72, 2007; J Immunol 184:2539-50, 2010). We are exposed daily to tens of thousands of potential bacterial pathogens, through dermal contact, ingestion and inhalation. The system of innate immunity prevents these pathogens, in small to modest doses, from colonizing and growing to a point where they can cause life-threatening infections. The case for a primary role for antimicrobial peptides in innate host defences is becoming increasingly convincing and is discussed in detail in our recent reviews in Nature journals. Other researchers have emphasized the direct antimicrobial activity of these peptides and called them antimicrobial peptides. Although the activity might be explained in part by the known antimicrobial nature of such peptides, this activity is heavily antagonized by the high concentrations of cations (particularly Mg2+ and Ca2+), antagonism by extracellular glycosaminoglycans such as heparin, and the relatively low concentrations in most locations in the body (except likely the crypts of the intestine and granules of phagocytic cells). In 1996, we demonstrated that insect hybrid peptides could protect against endotoxemia in animal models, revealing that cationic peptides had activities distinct from direct antibiotic action. There is now a growing body of evidence, including work from our laboratory for an impressive variety of activities of cationic antimicrobial peptides other than direct killing, whereby these peptides act directly on cells of the immune system. Indeed these immunomodulatory activities occur under the same conditions that inhibit antimicrobial activity. We were among the first to propose that immunomodulatory activities were the principal function of natural cationic peptides and subsequently showed that a peptide completely devoid of all antimicrobial activity (IDR-1) could still protect animals against a variety of infections. Functional genomics, animal model and biochemical studies from our laboratory have demonstrated that these peptides interact directly with host cells to modulate innate immunity in a unique fashion, decreasing potentially harmful inflammation while stimulating protective innate immunity. 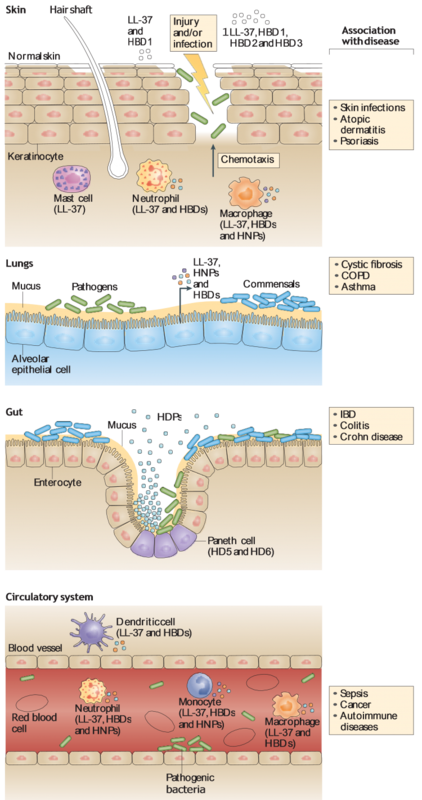 These functions have been further pursued in an attempt to understand and exploit the many roles of host defence peptides in innate immunity and led directly to the founding of a spin-off company, Inimex Pharmaceuticals (technology licenced on to Soligenix that recently showed efficacy in oral mucosaitis in Phase II clinical trials), which developed this as an entirely novel approach to counter infections and inflammation. The lab subsequently identified and characterized small, so-called Innate Defence Regulator (IDR) peptides that boost the infection-fighting mechanisms of innate immunity while at the same time suppressing harmful inflammatory responses. This led to the award of two consecutive large Genome Canada grants to study the Pathogenomics of Innate Immunity (with Hancock as co-Director) and to two Grand Challenges in Global Health Research grants one of which was to develop novel anti-infective therapies based on the modulation of innate immunity. These studies involved more than a dozen major collaborators and led to the development of improved immune modulators for treatment of infections and inflammation leading to formation of ABT Inc. The most active IDR peptides (e.g. IDR-1018) demonstrate superior protection in animal models able to protect in animal models against many different microbial infections, including antibiotic resistant infection models against the superbug methicillin resistant Staph aureus (MRSA), E. coli, MDR tuberculosis, Pseudomonas aeruginosa, as well as cerebral malaria and inflammatory diseases, providing a new concept in anti-infective therapy. Good activity in models of wound healing, pre-term birth and cystic fibrosis has also been achieved. In addition with funding from the Grand Challenges in Global Health Program we demonstrated that the IDR peptides were excellent components of new vaccine adjuvant formulations and could be used in combination with specific antigens to enable immune responses that were high titre (humoral or cellular), mixed Th1/Th2, protective in single dose, able to work in pigs, cattle, and mice, and effective in neonates. Systems biology approaches including high throughput RNA-Seq and network based bioinformatics using our new program NetworkAnalyst have helped considerably in understanding how these agents work. These peptide are currently being developed pre-clinically to treat diseases of animals and man and recently Hancock formed a new company, ABT Innovations Inc to pursue the many opportunities offered by these peptides. The human antimicrobial peptide, LL-37, is a multifunctional modulator of innate immune responses. An anti-infective peptide that selectively modulates the innate immune response. Effective adjunctive therapy by an innate defense regulatory peptide in a pre-clinical model of severe malaria. Novel vaccine formulations against pertussis offer earlier onset of immunity and provide protection in the presence of maternal antibodies. The immunology of host defence peptides: Beyond antimicrobial activity.